You are here: Home / Lifestyle / Overnight. During the night last night temperatures dropped. I had strange dreams about my high school friends. And these oats were a’soakin’! As much as I love hot creamy oats, I really do proclaim overnight oats in a nut butter jar to be my favorite breakfast of all time. The sticky, salty texture is the BEST! 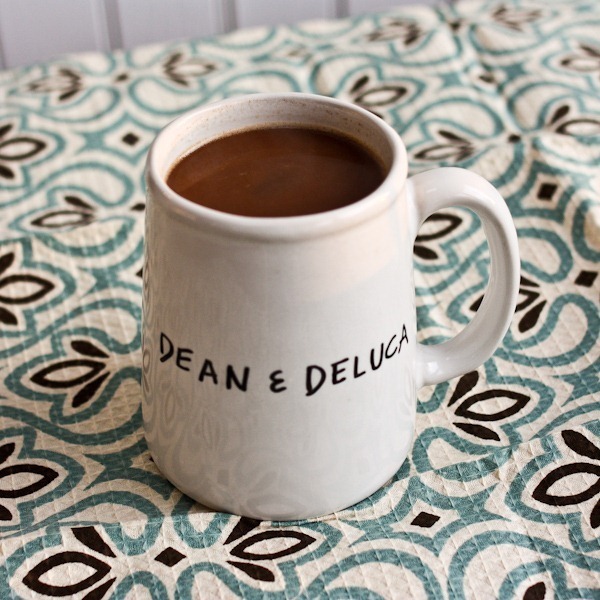 I made a mug of Choffy this morning [a caffeine-free cacao brew like coffee]. Rich! New towel from Target! Just love the texture, color and patterns on these! Sounds like the right time to order some Barney Butter! I’ve had a few strange dreams recently too – maybe the drastic change in temperatures? I really want to try these overnight oat recipes, but just never think of it when my pb is running on empty! I have fallen in love with overnight oats this past year and your morning posts always help me start out my days with a new yummy variation on the same old same old. I love fruit and nuts in my oats but ever since I tried incorporating nut butters I’m hooked!!! can’t wait to try some in the end of the jar! I really like overnight oats so much better than regular cooked oats. It was so cold here last night, we had hot oatmeal for dinner, they sure were warming. this reminds me… i really need to try some of that Barney Almond Butter! i’ve only ever heard great things. looks delicious! I’ve been wondering where you purchased the choffy because it always sounds like something I’d love to drink after dinner. Just your grocery store? 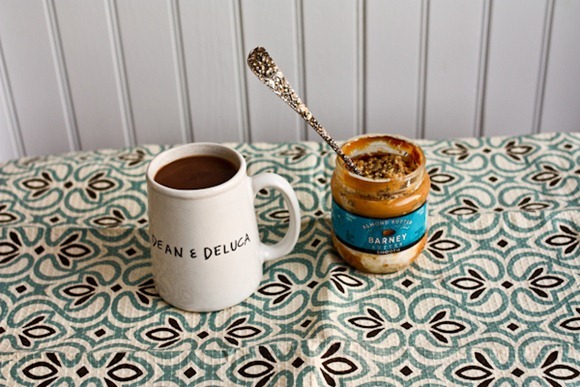 On this chilly morning, overnight oats sounds perfect! I have my usual ‘mash’ and then I’m off for a run…hope the sun comes out in time! Love the tea towel…I am in the hunt for some pretty tea towels myself…wish we had a Target…think they are coming to Canada. I love your new towel too! And what an elegant looking spoon you’ve got this morning! 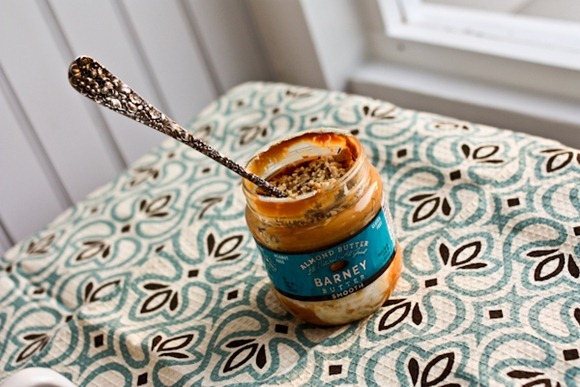 You mentioned in the OpenSky BB description that this is one of your top 10 nut butters- how does the rest of the list shake out? Just curious! Maybe it’s just from all of the end-of-year “Best Of” lists, but I love them! OH man, I know I’ve done this list before. Love that towel! I need some new ones, I’m sick of all of mine and they’re not nearly as fun as that one. 8 degrees here last night! Left my contacts in the car and they were frozen in the case this am! Ooh! Choffey is caffeine free?! I’m pregnant and have been looking for new hot drinks without caffeine! I might have to try this stuff! Your new towel is so pretty! And the temperature dropped here in NYC too… 14 degrees!! I’m in LOVE with your spoon!!! Do you remember where you got it or what brand it is? For some reason I only like Overnight Oats in the Summer. Even if I heat them up!! Gotta lot printed dish towels and napkins that double as placemats. Overnight oats are awesome… but I just can’t do it in 24 degree weather. Is it summer yet?! I had weird dreams last night too… involving my cousins, a really fancy espresso machine that put whipped cream and sprinkles on your drink and m&m cookies. Not sure what was with me last night 😉 Have a good day! I just recently started making overnight oats after reading about them forever on blogs. I don’t know how I went so long without them! Target has some of the best linens! Love! I’ve been eating overnight oats on most weekday mornings because it’s the easiest, most convenient thing to bring to work. But, I just do not get the hype of Barney Butter! I love almond butter, but am just not impressed with this brand. To me, the self-serve fresh ground almond butter at Whole Foods is the best. And strangely enough, I think that Blue Diamond is right up there too. But my favorite o.o.i.a.j. definitely goes to the nearly-empty Sunflower butter jar! Love the detail on your spoon! I inherited my grandmother’s silverware a couple of years ago and always feel so fancy when I use it. Ahhh oatmeal in a jar is the best!!! Weird dreams over here too! Have a nice day, Kath! My favorite breakfast EVER. Hope you have a great day Kath! 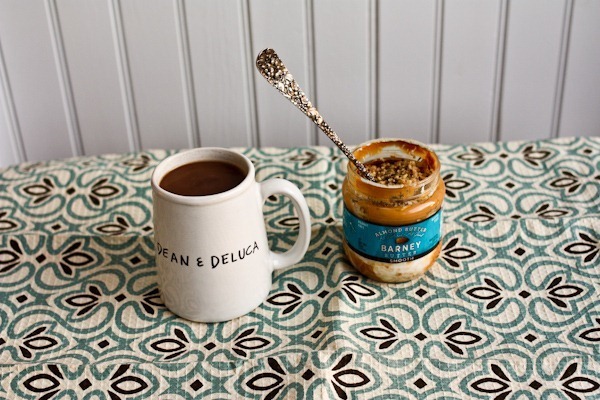 I’m working on finishing a jar of nut butter so I can make some overnight oats soon, too! I usually love hot oats in the winter, but you really can’t beat a good jar of overnight oats! Oh, and Barney Butter back at Open Sky?! Hooray! That looks delicious! I love your unique spoon by the way. 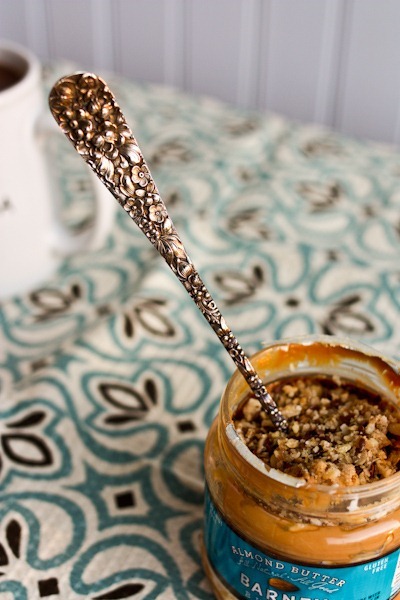 Every time I spot a similar one at stores like Pier One or Winners, I always think to myself “Hey, that’s Kath’s spoon”! I love the pattern on that towel! It’s so pretty! 🙂 Those oats look mighty delicious too! The oats in a jar look wonderful. I am assuming when you do this, you make it all first in one bowl, then transfer it all back into the jar. See, I make my oats in the microwave to save time and whatever I make it in, I eat it from…but there’d be no way a plastic container like that would survive. But I think you make on the stovetop, anyway. No noooooo—- overnight oats are never cooked!! All raw. So there’s no plastic fear. I have 2 almost empty pb jars…so excited. Also, I love the linens you used today…such good colors! 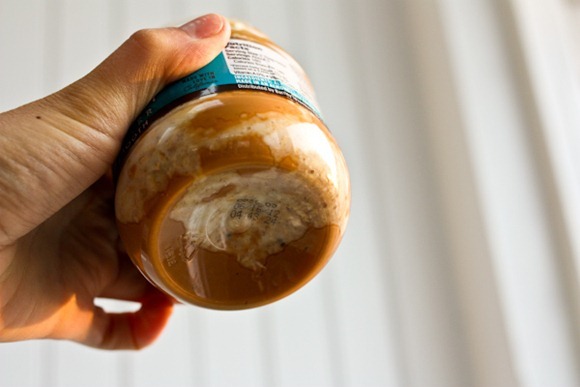 I have been making overnight oats for years but never thought to put them into an old jar! I usually make my own Almond butter but just invested in some jars..will definitely be trying this! Also the Choffy sounds amazing!!! Can you only get it online? I really need to jump on that Choffy. It’s perfect for someone avoiding coffee caffeine! yum breakfast looks delicious as always! Woo! I got your Barney Butter deal today on Opensky. I’m stoked. How many 8oz cups do you get out of the 12oz Choffee bag? I want to order it but I couldn’t find that information on the website. Thanks! 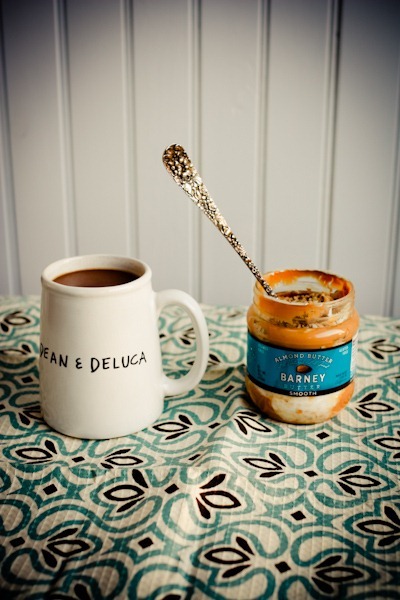 I totally need to do overnight oats again soon–a jar is almost empty! Oats in a BB jar are the BEST! I had a dream with you in it. I was in college at NC State and couldn’t find the classroom. You pointed me in the right direction. I guess that means I should always take your direction! I wish I had learned YEARS ago that Mom is always right! We should put that on a wall plaque and sell it for Mother’s Day! I love dreaming! Especially the weirder they are, the better. 🙂 I would have to agree that OOIAJ IS probably the most satisfying, delicious, and fun breakfast ever! It’s like, when I eat it I don’t want it to end and try to savor it as long as possible. 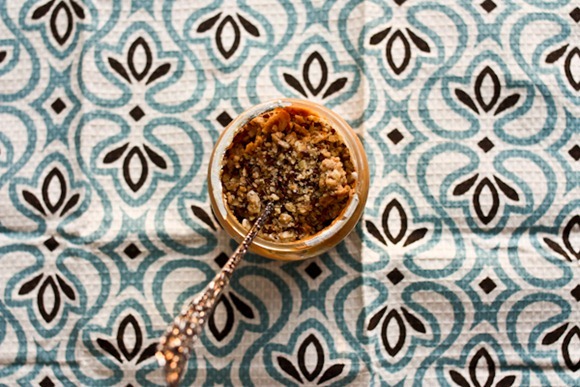 Love my over night oats in a nut butter jar. Just the best! I need to make overnight oats more often! I’ve been relying on semi-instant oats lately, and they’re yummy and filling…but even that 5 minutes of boiling the water in my kettle and waiting for it to cool to an edible temperature is sometimes too much on a frantic morning! Thanks for the great price on Barney Butter at OpenSky. At our grocery store they go for almost $10 a jar and that is WAY to much for me! Can’t wait to get my order! I have never tried overnight oats and I think I need to soon! I was wondering if you could provide a link for that towel…? I adore it and was hoping to find them online but am not having any luck. Let me know if you have a link! I’ve been making overnight oats for over a year now since I first read your blog about them! I absolutley LOVE when my PB jar is almost gone because I know I can make my overnight oats for breakfast the next morning. To be honest, that is the only time I make them now; when I have a jar of PB on empty! 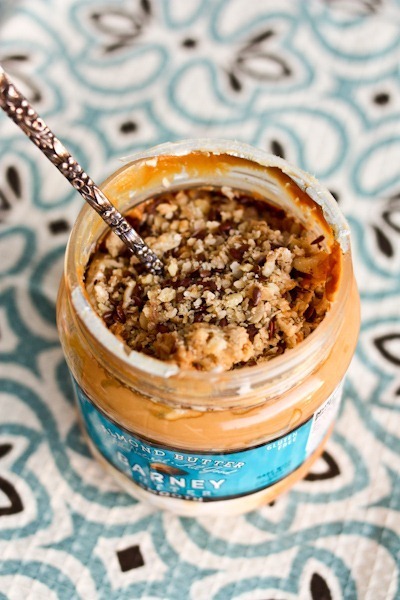 I love scraping the pb off the side with a scoop of the creamy, sweet oats! Thank you for the great idea, it truely is one of my favorite breakfast ideas! Wow, your site is amazing!! I am loving Choffy, do you know if this is available in Australia?